This stunning work of art is a four-year labour of love by an artist who has clearly drawn on an enormous range of personal sources and media to populate and complicate his rich and compelling graphic novel. 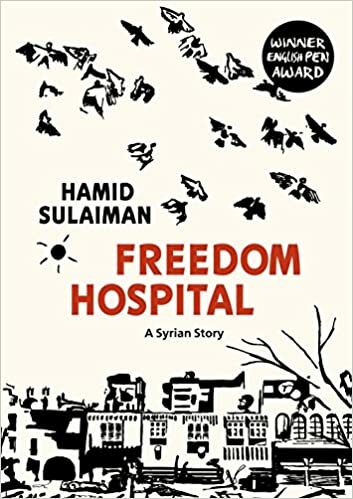 Freedom Hospital doesn’t claim to be comprehensive, or objective, or a documentary — but nor does it claim to be entirely a work of fiction. Somewhere in that blurring of genres lies part of the book’s huge impact. This is an extremely nuanced and personal slice of recent Syrian reality shown from several shifting and often surprising perspectives, which manages to avoid cliche and caricature almost entirely, despite its lean structure. Space is given to a fairly broad range of characters here: reading the character list at the start of the book is a treat in itself, and suggests the insight that is to come. As a translator of Arabic I can’t comment on the translation in anyway real way, as the original was in French not Arabic, and I haven’t even seen it. But I will say that read as a monolingual text it really shines linguistically: language is fluent and assured, slang is convincing, and decisions of detail over use of Arabic greetings and religious phrases have been made thoughtfully and well. There are two very powerful narrative devices Suliaman develops to great effect in his book: one is the mounting body count shown running alongside the text whenever time moves on, whether by a few hours or a few weeks. This throb of agony running through the text keeps jerking the reader relentlessly back to the reality of the Syrian carnage, unfathomable as it remains. Likewise, every time a weapon is shown, whether being used by the Syrian state army or anyone else, it is clearly labelled to show where it was made: Russia or the United States. So even whilst engrossed in the action on the ground, we are repeatedly forced to focus on the bigger picture. If all this sounds unbearably heavy, it is — but it’s worth it, and there is a resilience of the human spirit and the will to connect with our fellow humans that shines through very strongly. And, relatively speaking, there is some light relief to be found in the magic-realist elements to the plot, provided courtesy of the hash and looted pharmaceutical drugs some of the characters use to cope with the stress and trauma of their lives. The occasional abrupt jump in time or action does mean the narrative can be slightly hard to follow at points, and sometimes so much action is getting crammed into the pages that there doesn’t seem to be room for much detail in terms of emotions, or subtle conversation. Back story or context is also often presented to the reader via rather contrived dialogue, and might perhaps have worked better in inset text boxes. In other places, however, this backstory-as-dialogue device works extremely well, producing an elegantly haunting scene (as is the case when Elias describes being tortured and forced to lie on state TV). In any case, these occasional minor glitches or lurches are only details, and don’t detract from the overall power and grace and potency of the tale. This graphic novel should be read by any reader remotely interested in Syrian narratives. One of its great achievements is that it has so much to offer a broad spectrum of potential audience, from someone who has only a rudimentary mass-media-based notion of Syria to someone closely connected to that place and its people. Creating something that works on that many levels is no mean feat, and certainly something to be celebrated. Alice Guthrie is a British translator, a writer, and an editor. She studied Arabic in Damascus, Syria.